ShredAssured provides Confidential Document Destruction and Paper Shredding Services to clients throughout Broward County. 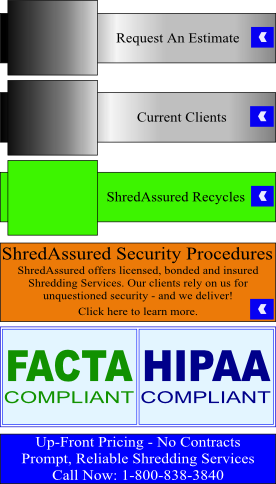 ShredAssured specializes in the secure destruction of your confidential information and materials. We shred and destroy paper documents, computers, hard drives, servers, copiers, microfilm, microfiche, CD's, tapes and X-Rays. We can also safely and securely destroy many other forms of proprietary materials including product packaging, pill bottles, retired uniforms and obsolete or defective products. Upon completion, ShredAssured recycles all of the paper, metals and plastics that we’ve destroyed. ShredAssured is fully licensed, bonded and specially insured. We are members of, and strictly adhere to the NAID "Code of Ethics", and strive to be the foremost paper shredding and data destruction company in South Florida. 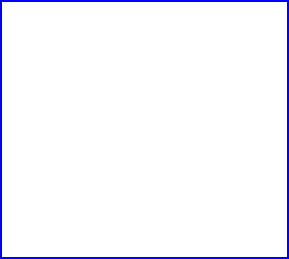 NAID (The National Association for Information Destruction) is the international trade association for companies providing information destruction services, and sets national standards for data destruction. We realize that while your priority may be a fair price, your primary objective is to protect and safeguard your confidential information. Our goal is to provide the highest level of security and the best value in the market. Period. • Any confidential materials you do not want to fall into the hands of the wrong people! • The secure shredding and recycling of paper documents. • The secure destruction and recycling of computer equipment and electronic media. • The secure destruction of defective or obsolete products including retired uniforms. • A convenient drop-off location where you can witness the destruction first hand. • A Certificate of Destruction certifying the time and date your materials were destroyed. • Service after business hours and on weekends at your request. • A complete line of secure shredding services to fit your needs. • Comprehensive, economical shredding programs. • A secure office shredding policy, insuring compliance with all governmental regulations. • Prompt, professional and courteous service. • Bonded and specially insured personnel. • The removal and recycling of cardboard boxes with no additional fees. • Residential / Home office shredding services. • Confidential data destruction services to clients throughout South Florida. Whether it's personal documents, a home based business, a small company with a few employees, or a large corporation with multiple locations and thousands of employees, you have sensitive material which, in the wrong hands, could damage or even cripple your business and reputation. If you keep records of various types, your company’s security could be breached if the materials are merely thrown in the garbage or viewed by the wrong people. ShredAssured will customize one of our secure shredding services to meet your needs. We provide On-Site or Off-Site shredding and offer different container options for your work place. We can pick up your material as often as you require. ShredAssured gives you the highest quality service you should demand, as well as the peace of mind you should expect. Please feel free to review our website and frequently asked questions to help determine which of our services is right for your organization. 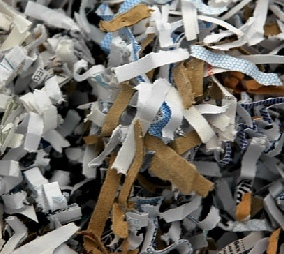 We offer many secure shredding solutions for every confidentiality need. Contact us today for a free estimate. We're serious about shredding. We understand the necessity of keeping control of your records, documents and other proprietary information. We can save you time, money and labor by providing you with an economical alternative to maintaining equipment and space, plus we offer many comprehensive choices for secure destruction. Your security will never be compromised and neither will your budget! ShredAssured is trusted by many information sensitive industries throughout South Florida. Our diverse clientele includes government offices, schools, healthcare agencies as well as financial institutions, manufacturing companies and correctional facilities. We have established these relationships by providing our clients with superior security, outstanding customer service and cost effective pricing. No matter the type of organization, or whether you need to comply with FACTA, HIPAA or Gramm-Leach-Bliley regulations; ShredAssured is your answer for Maximum Security and Privacy Protection! 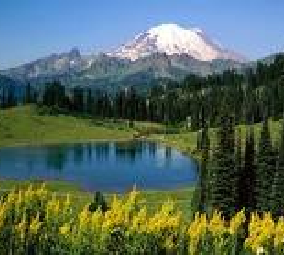 ShredAssured is locally owned and professionally operated. Confidential Data Destruction is all we do and our emphasis is on Excellent Customer Service. ShredAssured is not a national franchise. Nationally franchised companies tend to operate on a bureaucratic level, be very inflexible and have higher overhead costs. When you call ShredAssured, you’ll always speak directly to a local service representative instead of an out of state switchboard operator. Because we are locally owned and operated, we can quickly respond to our customer’s special requests. Clients are always able to contact the owners of the company directly. Choosing ShredAssured means lower prices and more personalized service. Our Up-Front Price Guarantee means we won’t quote you a low price and then slam you with fuel surcharges and hidden fees. ShredAssured offers competitive pricing and guarantees that price in writing! Shred Your Shredding Contract! ShredAssured does not require long term contracts with huge penalties for early cancellation that most other shredding companies demand. We believe in earning your business every day, not just on day one. If, for any reason you need to cancel your Regularly Scheduled Service, all we ask is the return of our Security Container(s) and 30 days notice. No penalties - No questions asked! A solution for clients that require the secure destruction of their confidential electronic records and computer equipment. A solution for clients that have obsolete or defective products that requires secure destruction. A solution for clients who needs assistance in developing and implementing a cost effective, secure and compliant data destruction program. A solution for businesses and offices that are in need of regularly scheduled, or one time (purge) shredding services to securely destroy confidential documents. a secure document shredding service. drop-off and witness the destruction of their personal files and materials at their convenience.